2005 Souverain Winemaker’s Reserve Cabernet Sauvignon | Wine Splash! We have been looking forward to opening this wine and have had only good reviews from friends and the wine critics! This wine scored 92 points with Wine Enthusiast and 90 points with the Wine Advocate. We have always been fans of Souverain wines anyway so this one brings us back to its classic wine making style! We bought this bottle for $32 and it was worth every penny. In our glass, deep burgundy, even opaque in color. On the nose, hints of dark berry, black currant, anise, and herbs. On the palate, medium to full bodied, velvety, with a soft tannin structure. Flavors of blackberry, dried currant, spices, and toasty oak dance on our palate! Complex but with a long smooth finish that whispers leather, coffee, and more sweet oak. A wonderful Cabernet Sauvignon from Alexander Valley! We had this wine with spicy steak wraps and it was a nice combination. Would also pair well with medium to sharp cheeses, grilled red meat, barbecued chicken, pasta with a tomato based sauce, and a spicy mushroom burger. Yes, this is a perfect example of what Sonoma can really do with a Cabernet Sauvignon. We loved the complex layers and the menagerie of flavors! As we sipped this luscious wine, we had Mozart playing in the background which made tonight an elegant experience. 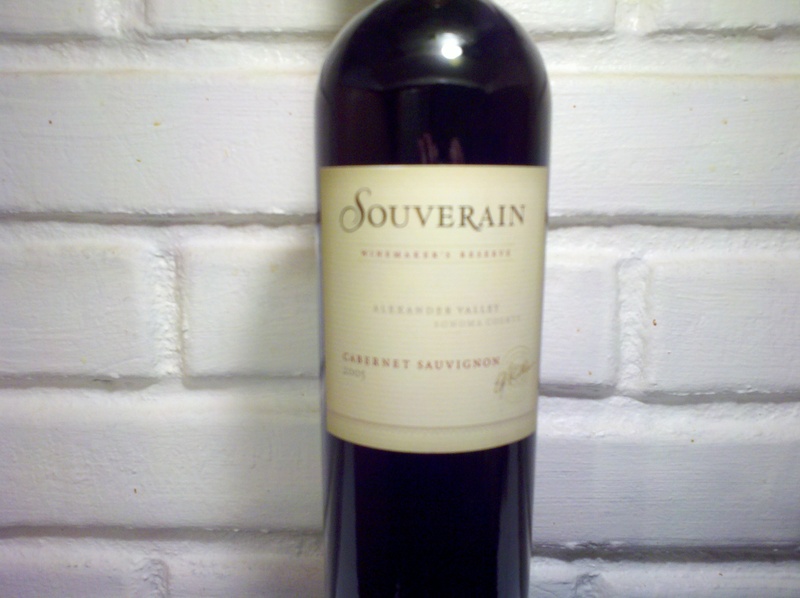 We rate the 2005 Souverain Winemaker’s Reserve Cabernet Sauvignon from Alexander Valley 91 points! A wine worth waiting for and patience paid off. If you have a 2005 vintage, we recommend you drink it now through 2014. WineSplashing! !